Has time run out on Marissa Mayer to save Yahoo? Wall Street is throwing in the towel on Yahoo. It seems that investors have no faith in the company's turnaround efforts under CEO Marissa Mayer. Shares of Yahoo (YHOO) are now trading around $30, just 3% above the 52-week low that it (and many other stocks) hit during the height of the market's panic on August 24. That's bad news. All of Yahoo's peers have rebounded sharply from the fear-induced lows of August 24. Yahoo is now down 40% this year. Brain drain and Alibaba woes. The company's chief marketing officer just left, adding to worries about a brain drain at the company following the departures of its chief accounting officer, vice president of analytics and the executive in charge of Yahoo's home page earlier this year. Last week, the IRS rejected Yahoo's request for a ruling that would allow the company to spin-off its 384 million shares in Chinese e-commerce giant Alibaba (BABA) in a tax-free manner. Making matters worse, Alibaba's stock price has imploded this year too. So the value of what was once Yahoo's crown jewel is becoming more like cubic zirconia than a diamond by the day -- regardless of what happens with the IRS. 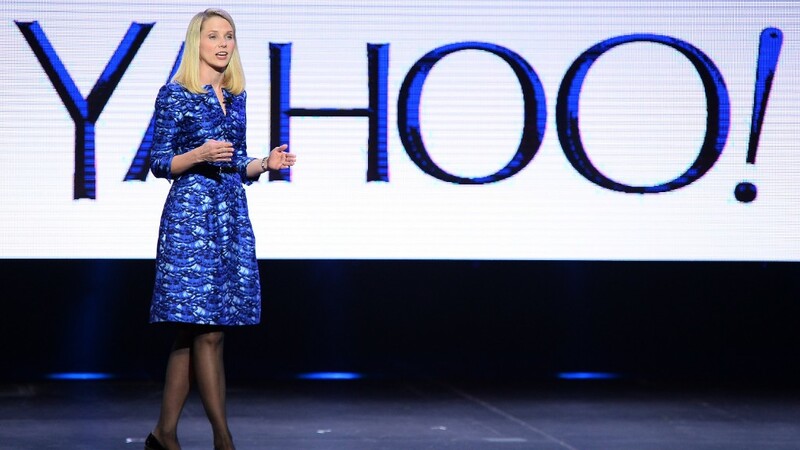 It's questionable if Mayer can convince a skeptical Wall Street that her strategy to revive Yahoo will ever work. To her credit, she has been saying the right things. She's talked about how Yahoo must become a bigger player in social, video and mobile. She's stressed that Yahoo, despite its troubles, still has a fairly large audience for its many sites. And she's also preached patience -- that it will take a while for some of her efforts (including a slew of small acquisitions) to bear fruit. There has been some progress. Sales are expected to increase by 15% this year, but that will merely bring Yahoo back to the amount of revenue it had at the end of 2012. And analysts are expecting sales growth to slow again next year to just 1%. Growls from Yahoo bears grow louder. That's not good enough. Mayer has been CEO for more than three years now. So the honeymoon period is over. Mayer's critics are becoming increasingly vocal. NYU Stern School of Business marketing professor Scott Galloway told Bloomberg last week that he thought Yahoo should be "euthanized" and added that Mayer is the most "overpaid CEO in history" and still has her job only because she just announced she was pregnant with twins. Those remarks are a bit over the line if you ask me. But it's understandable why people are so frustrated. Mayer was supposed to be the CEO that could finally make Yahoo a Wall Street powerhouse again. She would succeed where her numerous predecessors failed. Yahoo had 7 CEOs since 2001 before Mayer. Investors want to see concrete signs that Yahoo can gain more ground in the digital ad market against the likes of Google (GOOGL), Facebook (FB), Microsoft (MSFT), Verizon's (VZ) AOL and Twitter (TWTR). It would help if Mayer finally unloaded its Alibaba shares as well as a 35.6% stake in Yahoo Japan (YAHOF). Mayer will have more cash to play with if she can figure out what to do with the Asian assets. "Alibaba is still what drives Yahoo. After that, there's Yahoo Japan. Then there's the core business of Yahoo, which is mostly an afterthought for now," said Brian Wieser, an analyst with Pivotal Research. Some hope on the horizon? Interestingly though, most analysts still back Mayer even though the market does not. According to FactSet Research, the consensus price target for the stock is about $47, nearly 60% above current levels. Last week, Morgan Stanley analyst Brian Nowak reiterated his $51 target on Yahoo. He even called the stock a "fantasy sleeper" since he believes that Yahoo's new daily fantasy football product will boost profits next year. It will be interesting to see if Nowak and other Yahoo bulls ultimately wind up being right or not. For now though, Yahoo and Mayer continue to polarize Wall Street.